Eve: Aether Wars has shown the true power of its engine, with a 14,000 ship battle that was live-streamed at GDC 2019. The battle, which lasted an hour, was shown on the first morning of the conference and saw some 3,852 players (yes, you read that right) join a veritable armada of over 10,000 AI ships. Over the course of the action, some 88,988 ships were destroyed, making other sci-fi sagas such as Mass Effect look like a grazed knee by comparison. The showcase demonstrates the leaps made in massively multiplayer simulation games. Aether Wars was specially created to display the power of the Aether Engine, which was developed by London company Hadean to be the world’s first distributed simulation engine. Eve has a history of simulating conflict at an epic scale. The main game available to the public currently holds the world record for the most concurrent players in a single PvP event, when 6,142 players simultaneously fought to the death in January 2018. 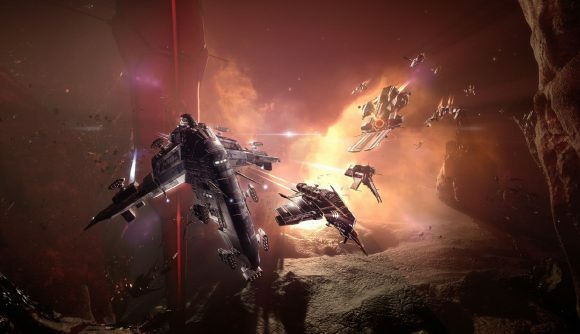 It’s mind-boggling to imagine what else could be achieved in Eve Online if the Aether Engine eventually becomes more broadly integrated. The game has already been the scene of some crazy and beautiful events, including $1m battles and memorial services that were server-wide.